Janie Rose Whitaker's world revolved around her chocolate shop until Roger Wentworth and his young daughter moved into the apartment across from Janie's. Anyone would think Roger fit the mold of the "perfect" guy, but soon Janie discovers secrets that could keep them apart forever. Though she resists getting involved in Roger's complicated life, they are drawn further into a bittersweet relationship. You will laugh, cry, and crave chocolate as you read this LDS paraody of the classic novel Jane Eyre. I absolutely LOVE the book, Jane Eyre. I fell in love with it the first time I read it in my college English Lit class. Ever since, I've re-read it at least once a year. Because I'm such a huge fan of the classic, I was excited, but also a tad bit hesitant, about reading a contemporary telling of Jane Eyre. It was one of the books on my to-read list that I was going back and forth, trying to decide if I was going to get it or not. But then I was asked to review Chocolate Roses and simply couldn't resist. I was pleasantly surprised with how well done the story was. I loved the quotes from the original Jane Eyre at the beginning of each chapter - it lent a feeling of connection between the classic and the new, and you could see how the modern day Janie felt connected to her favorite heroine, Jane. The Chocolate Roses heroine, Janie, was well-rounded. While reading it, I could see a lot of the same feelings about being an older single LDS chick that some of my former college girlfriends who are still single share. I really liked that. I thought the relationship/romance between Janie and Roger was perfect. From the very beginning, I just wanted to grab Roger and say, Look at her! The woman, not as an employee bagging your chocolate! I really liked how Roger moving next door Janie was woven into the plot. It was fun to see Janie's relationship grow with Roger's daughter. I have to stop here and mention that Janie has an awesome Great Dane, who is super funny at times. One of the things I was hesitant about was the love triangle between Roger, his wife, and Janie. I wasn't sure how that was going to play out in an LDS book. I won't give away any details, except to say I was really happy with Roger's faithfulness to his wife vs the feelings Janie had for him and his family (and which you know Roger is aware of). I was also worried that I would feel like the author butchered the characters from one of my all time favorite novels. I'm happy to say, I didn't feel like that at all. The characters in Chocolate Roses have some traits of the classic characters from Jane Eyre, but they also have enough of their own individual characteristics to make them unique and very appealing to both readers who are fans of the classic or who have never read Jane Eyre. Overall, I really enjoyed Chocolate Roses and most definitely recommend it to anyone looking for a great summer romantic read! For more information about Joan Sowards, you can visit her website. Chocolate Roses is available for purchase on Amazon.com and at your local LDS bookstore. Very interesting, this sounds like an intriguing read. Jane Eyre is one of my favorites, too. I'm looking forward to reading Chocolate Roses! 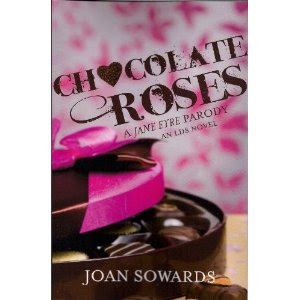 Thank you for the great review of Chocolate Roses!